On Broadway, Wicked grossed $1,401,082 and had a 96.5% attendance rate for the week ending January 23, 2011 and was 1.8% less than the last week. Wicked grabs the top seat again. The 19 shows on the boards grossed $12,343,580, dropping 10.69% from the previous week. 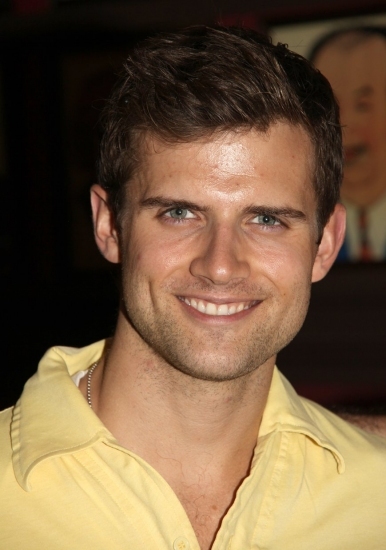 Kyle Dean Massey returns to the Broadway company of the hit musical Wicked at the Gershwin Theatre Jan. 25 in the role of Fiyero. Massey succeeds Kyle McDaniel and joins a cast that includes Mandy Gonzalez as Elphaba, Katie Rose Clarke as Glinda, Kathy Fitzgerald as Madame Morrible, P.J. Benjamin as The Wizard, Jenny Fellner as Nessarose, Etai BenShlomo as Boq and Tom Flynn as Dr. Dillamond. In related news, Teal Wicks will assume the role of Elphaba Feb. 1. She will follow Mandy Gonzalez, who will play her final performance Jan. 30. Wicks will be making her Broadway debut after playing the role of Elphaba in both the San Francisco and Los Angeles productions of the hit musical. Massey has been seen on Broadway in Next to Normal, Xanadu and Wicked, Off-Broadway in Altar Boyz and in the tours of Wicked and 42nd Street. Wicked features a score by Schwartz, a book by Holzman, direction by Joe Mantello and musical staging by Wayne Cilento. The creative team also includes scenic design by Eugene Lee, costume design by Susan Hilferty, lighting design by Kenneth Posner, sound design by Tony Meola, projections by Elaine J. McCarthy, wig and hair design by Tom Watson, music supervision and arrangements by Stephen Oremus, orchestrations by William David Brohn and dance arrangements by James Lynn Abbott. Get $10 OFF on Wicked Gershwin Theatre Ticket Orders over $350! Use Code AFF$10. Wicked Musical will be performing at Popejoy Hall, Albuquerque New Mexico from Wednesday, January 26 through Sunday, February 13, 2011. Wicked is recommended for children 8 and older; no child under age 4 will be admitted to the show. On Tuesday, crews at the University of New Mexico moved sets and took care of any loose ends before the musical opens on Wednesday night. The production will run from Jan. 26 to Feb. 13 at UNM’s Popejoy Hall. Good seats are still available! Best bets for seats are Tuesday, Wednesday, Thursday & Sunday evening performances and Thursday matinee on January 27th. Buy Best Wicked Tickets in Albuquerque, NM. Get $10 OFF on Wicked Popejoy Hall Ticket Orders over $350! Use Code AFF$10. Despite the current economic climate, the hit musical ‘Wicked’ has claimed a record in ticket sales. The show, about the loves and lives of two witches in the Land of Oz, took 1,002,885 pounds in a week – the highest in London theatre history, reports the Sky News. Going to see Wicked in the West End represents good value for theatre fans, said Wicked”s executive producer Michael McCabe – “This is millions of pounds worth of equipment and show”. “People are being careful with their money and they”re choosing shows they”ve heard of. They may have had a personal recommendation from a friend but it”s also value for money,” he added. Earlier this month, it was announced that Wicked had recorded its highest ever week of ticket sales over the festive period, taking in £1,002,885 for the seven days commencing December 27th 2010. The musical is showing at the Apollo Victoria Theatre and tells the story of the witches of Oz before they encountered Dorothy. Buy Wicked Apollo Victoria Tickets now and save $20 on your next order over $250. 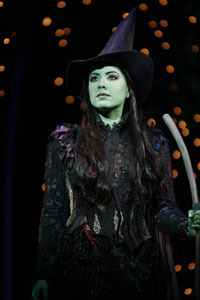 Watch the Video of Wicked Highlights from Wicked Broadway – Video Composed by Playbill.com. Question: Before we get to Wicked, were you able to attend the final In the Heights performance? Question: What was that night like? Gonzalez: It was incredible. Oh my gosh, I was so excited I couldn’t sleep the night before because I was excited to see the show for the first time, to see all my friends. It’s such a huge part of my life, so it was a really big night, and it was so incredible. I sat with my best friends, and I watched my best friends on the stage and I cried, I laughed, I screamed. It was amazing. It was an incredible closing night. Question: Was there anything that you picked up as an audience member that struck you in a different way? Question: Was it at all strange seeing someone perform the role that you created? Gonzalez: Not at all, no. I felt just very proud, and it brought back so many memories and thoughts of when those songs were actually created, and sitting in a living room with Alex Lacamoire and singing through changes of lyrics, and to see it up on the stage, it wasn’t strange at all. I just felt very proud. The whole evening, I couldn’t stop smiling. Question: Was it a difficult decision to leave the show to go into Wicked? I was with In the Heights for a long time, through all the workshops and everything, and after two years on Broadway, when they came and they offered me the part for Wicked again, I felt it was the right time. And, everybody at In the Heights was just so excited for me and proud; I just felt that I had all of their support. And, they all came to my opening night at Wicked. My closing night of In the Heights, it was very hush-hush that I was going to play Elphaba and everything was kind of kept on the low-down. And then, for my final bow … Alex had arranged this amazing orchestration for Wicked, and then Lin [-Manuel Miranda] came out in a witch’s hat and a green shirt [laughs] and handed me flowers. I don’t know, it just kind of seemed like a smooth transition. Mandy Gonzalez is currently starring in Wicked at the Gershwin Theatre through Jan. 30; she will be succeeded by Teal Wicks. “Wicked: The Musical” is on its way to becoming the biggest money making franchise in theatre history. Its success is well deserved, as demonstrated at it’s opening in Tucson at UA’s Centennial Hall. However, this popularity is due not only to performing talent, but also to a level of quality control and product improvement. “Wicked” is the imaginative backstory of Elphaba, the Wicked Witch of the West and her friendship with good witch and fellow student, Glinda. Gregory Maguire’s 1995 novel, “Wicked: The Life and Times of the Wicked Witch of the West” used both L. Frank Baum’s original stories and the 1939 movie, “The Wizard of Oz” as starting points. Maguire described a complex and violent history of events prior to Dorothy’s cathartic arrival from Kansas. Opening with a visitation by Glinda just after the death of the Wicked Witch, the story is told in flashback, including Elphaba’s conception and birth. It then jumps to their meeting and accidental pairing as roommates in college, where Glinda is empty-headed and popular and Elphaba is a smart, talented loner, though not necessarily by choice. Glinda does a self-serving favor for Elphaba’s crippled sister (who will become the Wicked Witch of the East), leading Elphaba to get Glinda her first training wand. The story of Glinda and Elphaba’s wary friendship, growing gradually into lifelong love and respect, is another dimension, as is Elphaba’s transition from outcast girl who desperately wants in, to empowered woman. The stars of this production, Vicki Noon as Elphaba and Natalie Daradich as Glinda, are electric, especially in their numerous scenes together. Prior to being selected for this national touring company, they were both standby’s for their respective roles in the show’s 2009 San Francisco production. They were also both in the show’s Los Angeles cast. Vicki Noon brings an incredibly powerful and assured voice. She commands the stage during her solos: giddy and hopeful in “The Wizard and I,” simultaneously vulnerable and courageous in “I’m Not That Girl,” and openly terrifying in “No Good Deed.” She also deftly handles her physical transition from awkward/angry schoolgirl to supernaturally empowered witch. 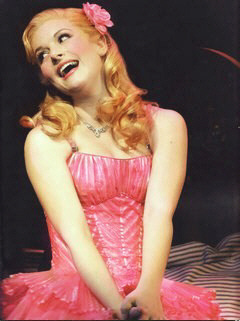 Actresses playing Glinda have a more difficult character arc, going from comic blonde to tragic leader. Daradich proved herself a master of physical comedy with her annoying perkiness, adroit dancing (both serious and goofy), giggles and girly leg flicks. Leaving the show, groups of girls were laughing as they re-enacted the “hair toss – toss – flutter” moves that she tries to teach Elphaba. As happiness eludes her, Daradich completely sells her tragic aspects with depth and nuance. Natalie Daradich also well-voiced, though her character requires her to use more nasal tone and an excessive vibrato to undercut any potential seriousness. She demonstrated in the emotional final duet with Noon, “For Good,” that any affectation to her singing was a controlled professional choice. The other cast members, they all do exemplary jobs in their respective parts, but their roles are numerous and minor in comparison to the two leads. However, the overall ensemble deserves mention for their outstanding singing and dancing. As good as the “Dancing Through Life” scene was, it was dwarfed by the color and extravagance of the Emerald City number, “One Short Day.” The finale, when they have returned to their surrealistic Les Miserable mob style of the opening scene, singing what can only be described as the “Wicked” chord, is as perfect and memorable as an ending gets. “Wicked: The Musical” has been shrewdly marketed – the franchise practically owns the color formerly known as “chartreuse.” Its quality control is formidable. Casting for all the productions is handled by a centralized company. Costuming, choreography, and set design are standardized. The only concessions to local variance are the venue’s requirements and the inclusion of nine area musicians to augment the touring company’s in-house band. Wicked Musical will be a Big hit in Tucson AZ, performing through January 23, 2011. Tickets are still available for few shows. Buy Wicked Tucson Tickets Online and Save $10 on Wicked Ticket Orders over $350! Use Code AFF$10.